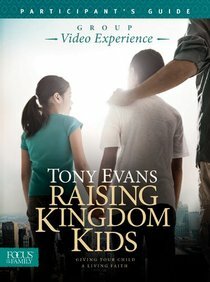 :This Participant's Guide is a companion resource to the six-week DVD-based curriculum Raising Kingdom Kids with teaching by Dr. Tony Evans. The six sessions included in Raising Kingdom Kids Group Video Experience provide practical examples and illustrations to help parents grow kids? faith, with specific instruction in the power of prayer, wisdom, love of God's Word, getting through trials, controlling the tongue, developing patience, and the surrender of service. One sample Participant's Guide is included in the Group Video Experience, and an additional copy is recommended for each group member. About "Raising Kingdom Kids (Participant's Guide)"